web, based, accounting, business, software, web based, web-based, free, linux, free accounting, inventory, web. No user restrictions, nag screens, or expiration. Customization available to fit NolaPro to your business or industry. 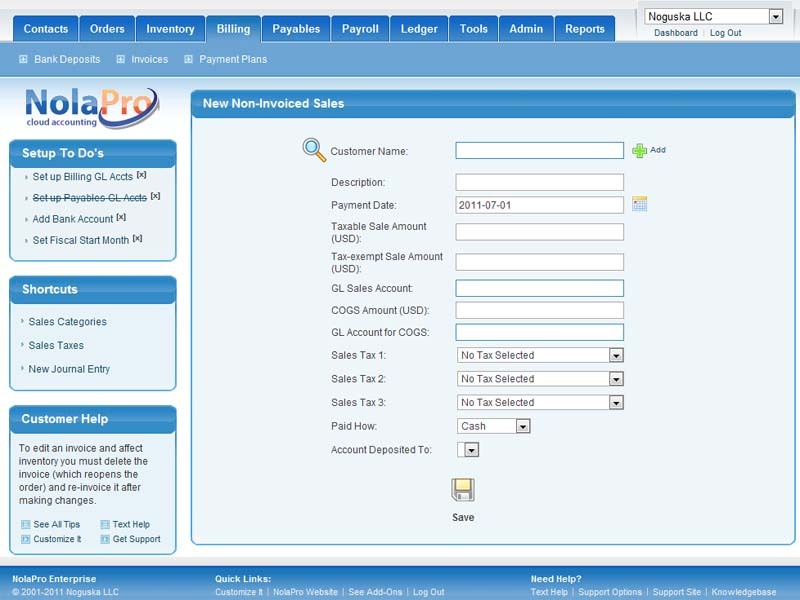 NolaPro is a free Cloud Accounting suite that can be securely run from your PC. Refine and manage your business with its flexible and powerful Customer tracking, Billing, Payables, General Ledger and Reporting features.Optional modules include Inventory Control, Service/Labor Order management, POS/Fulfillment Order support, a B2B web portal, eCom Shopping Cart, vTiger add-on, Employee Timeclock, QuickBooks converter, development API and many more.White Label partner revenue versions are available for CPAs, VARs and consultants. For international users, it offers Multi-Currency, VAT/GST support, multi-language capability, and currency, decimal & temperature flexibility.However NolaPro's customization is its best feature. It can be modified upon request to fit any industry spec or business requirement, as well as integrated with most 3rd party applications to provide backend accounting support.Secure Business Cloud hosting and a Linux version are also available directly at the NolaPro.com website. software to fit your business operations or industry niche. International features such as multi-currency, VAT/GST and built-in language translator all supported.